Allergy Information: Individuals allergic to pollen from a weed called mugwort (Artemisia vulgaris) can develop an allergy to camomile because of the similarity between the allergens (proteins) in both plants. They react to the herb with respiratory tract symptoms (e.g.wheezing), vomiting, cramps, diarrhoea or even more severe reactions like a skin rash. 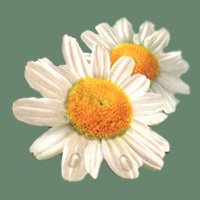 Individuals react to dried, boiled or fresh camomile plants or extracts. Reider et al. (2000)  described the symptoms observed in subjects after oral intake of camomile tea. All had respiratory tract - rhinoconjunctivitis, wheezing and dyspnea, fewer with gastrointestinal tract symptoms - vomiting, cramps, diarrhoea or some experiencing other systemic symptoms like urticaria, angiooedema, hypotension. Patients experienced symptoms of comparable intensity and quality, no matter if exposure was to dried, boiled or fresh camomile plants or extracts. Skin prick tests were performed by the prick method. PBS glycerol-solution and histamine hydrochloride (10 mg/mL) were used as negative and positive controls, respectively. Wheals greater than 3 mm were considered positive (Florido-Lopez et al. 1995) . All patients showed a positive reaction with camomile extracts (Florido-Lopez et al. 1995 ; (Reider et al. 2000 ). For immunoblotting studies Reider et al. (2000)  used hot water camomile extracts and compared them to dried/fresh camomile extracts. Protein separation was performed using 10% acryamide 1D SDS-PAGE gels. Samples were reduced with beta-mercaptoethanol. De la Torre-Morin et al. (2001)  also reported that 12 of the patients with a positive oral provocation test were also positive for bronchial challenge and conjunctival test with chamomile. Clinical cross-reactivity between Artemisia vulgaris and Matricaria chamomilla (chamomile).